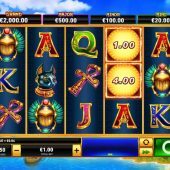 Scarab Queen slot by Playtech Egyptian theme with jackpots! 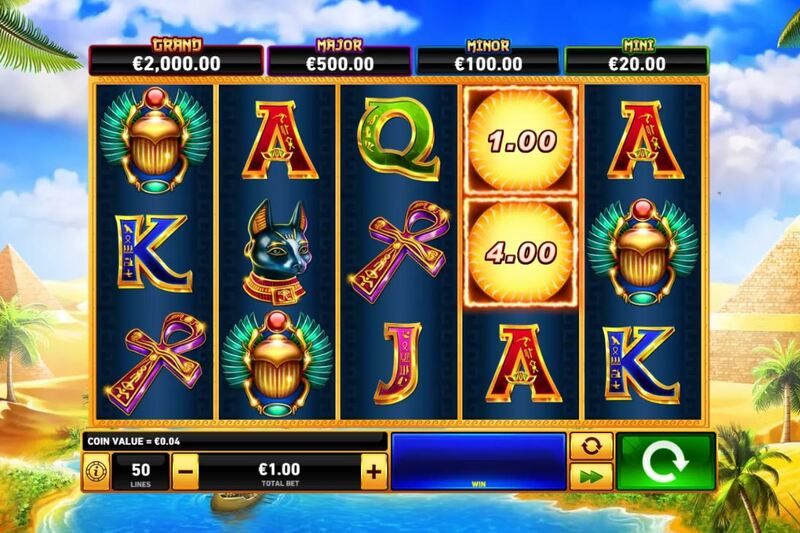 Scarab Queen by Playtech is designed by Rarestone, an in-house developer of theirs. The theme will be no mystery as it's yet another Egyptian game to join The Mummy and Desert Treasure of theirs and a vast catalogue from other providers such as IGT's Cleopatra and Cleopatra Plus classics. The reels sit over an oasis by the Great Pyramids and Egyptian music constantly plays in the background, punctuated by some pretty retro and basic sounds when wins drop in or features trigger. Let's hope the Scarab Queen bestows the fortunes of Ra upon our bankroll. If you see 6 or more Suns anywhere in view you trigger a respins game. The tokens all have amounts overlaid ranging from 1 to 5, 10, 15 or 50x bet. These triggering Suns stay in position and now the reels only consist of blanks or Suns. You have 3 respins which reset to 3 every time a fresh Sun is added. When you've had 3 consecutive dead spins, the bonus ends and you are paid the total showing on all the Suns. If you fill all 15 positions, you get the Grand Jackpot. If you don't, but land a Star on one of the Suns, it will reveal either the Mini, Minor or Major jackpot. If 3 or more Pyramid scatters appear you win 8 free spins. You can retrigger these but there are a couple of important enhancements. Firstly, the stacked Wild Queen now appears on all 5 reels and secondly, every spin one reel is guaranteed to appear fully filled with either a Wild or Sun symbols, increasing the chances of both wins and the progressive game. The progressive game is quite good as it usually pays at least 15x bet.